Step inside "American Horror Story: Freak Show," the terrifyingly twisted reincarnation of TV's most shockingly original series. Jessica Lange leads an extraordinary, award-winning cast that includes Kathy Bates, Angela Bassett, Sarah Paulson and Michael Chiklis. Lange plays Elsa Mars, the proprietor of a troupe of human "curiosities" on a desperate journey of survival in the sleepy hamlet of Jupiter, Florida in 1952. Her menagerie of performers includes a two-headed, telepathic twin (Paulson), a take-charge bearded lady (Bates), a vulnerable strongman (Chiklis) and his sultry, three-breasted wife (Bassett). But the strange emergence of a dark entity will savagely threaten the lives of townsfolk and freaks alike. "Freak." It's a word often cruelly used to describe those that are considered different. Those that break away from the so-called norms of society in appearance or behavior. And in its own way, 'American Horror Story' has always been a bit of freak itself. A clear outcast among the television landscape never content or comfortable playing by the rules, the series continues to be a macabre oddity with a narrative rhythm and style all its own, infamous for its twisted scares and unconventional plotting. But as strange and unusual as the anthology series remains, the show refuses to take this label as an insult. No, like its characters, the series wears its unique attributes like a badge of honor. A very, very bloody badge of honor. For its fourth season, the series turns its attention to a "Freak Show" set up in Jupiter, Florida during the early 1950s. Led by the aging German singer Elsa Mars (Jessica Lange), who desperately craves stardom, the carnival of oddities is home to an eclectic family of performers. But when a murderous clown (John Carrol Lynch), two con-artists, and potential betrayal from within all threaten to disrupt their lives, the unusual troupe will have to band together to fend off outsiders and punish those who wish them harm. As with previous installments, the filmmakers once again bring back several familiar performers from past seasons, casting them in entirely new roles. 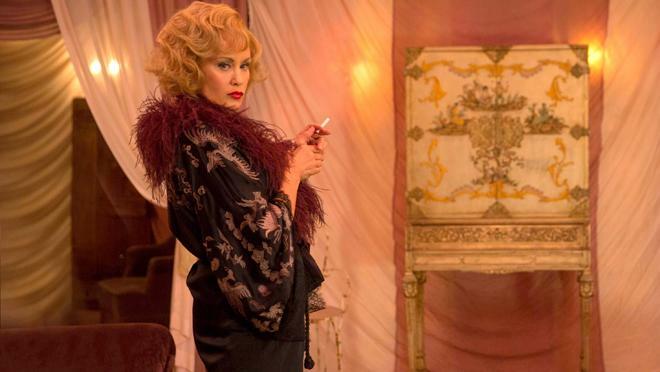 Series headliner Jessica Lange is rather perfect (as always) as the narcissistic yet complicated Elsa Mars, and other 'Horror Story' mainstays like Evan Peters, Denis O'Hare, Frances Conroy, Emma Roberts, Angela Basset, and Kathy Bates all turn in memorable performances as well. Likewise, the show wisely adds a few new, talented differently-abled performers like Mat Fraser into the mix, giving the season an added level of authenticity. With that said, special note must really go toward Sarah Paulson. In the dual roles of conjoined twins Bette and Dot, the actress is able to craft two entirely different personalities that manage to play off each other without ever feeling unnatural. Of course, she is aided by some fantastic VFX, helping to create a fully believable two-headed woman on screen. The rest of the show's makeup, production designs, sets, and effects work are equally strong, fully bringing the "Freak Show" setting to life with palpable personality and appropriately creepy ambiance. 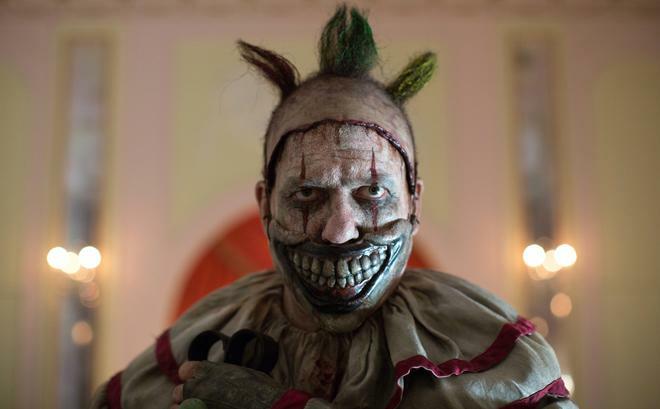 The season's iconic "Twisty" the clown is particularly memorable for his ghastly appearance, joining previous monsters like Rubberman and Bloodyface into the collective nightmares of loyal viewers. Distorted shots, wide angles, and spooky lighting help to draw out some scares with the show's typical bag of tricks, and the filmmakers also throw in some clever split screen POV techniques to evoke the different perspectives of the conjoined twins. Throughout the thirteen episodes presented, the story chronicles a violent yet ultimately affecting tale about society's outcasts. Thrown away by the rest of the world, the carnival performers find solace in each other (which makes their growing betrayals all the more damning). The writers also play around with the very concept of "freaks" to great effect, showing us men and monsters of all shapes and sizes -- revealing that sometimes the most horrific and evil creatures of all, are the ones that look the most beautiful on the outside. Season highlights include the show's traditional Halloween two-parter and a late season flashback episode that fills in some gaps about how the "Freak Show" was formed, adding some rich layers to the complicated character dynamics. Unfortunately, though a definite improvement over the previous year's distressingly uneven 'Coven' storyline, 'Freak Show' continues to demonstrate many of the same issues. The overall plot ends up being more cohesive than that messy narrative, but the show still tends to meander, causing certain beats to run in circles. On that note, the characters' motivations fluctuate too much, and by the time the season has ended, it becomes rather hard to feel sympathy for anyone. In some form or another, almost all of the major players are murderers and it's hard to really root for anyone when all they seem to do is kill each other. Similarly, the show's overwhelming amount of gore can also be a bit much. I'm usually not the squeamish type, and I found the splashes of twisted imagery to be quite effective in 'Murder House' and 'Asylum,' but here the constant carnage really does become rather repetitious and downright gratuitous while rarely coming across as genuinely scary. Between disturbing snuff films and baths full of blood, I started to question why any of it was really necessary. Still, as troublesome as certain aspects of the production can be, "Freak Show" does end on a very strong note. In fact, without giving too much away, the season finale might actually be my favorite of the entire series. The final scene is strangely ethereal and surpassingly sentimental and oddly moving and faintly haunting… and just kind of perfect, bringing an unexpectedly emotional conclusion to the story that helped to elevate some of the otherwise uneven material that gets us there. Proudly celebrating all of the "freakish" qualities that make the series so unique (and occasionally problematic), 'American Horror Story: Freak Show' offers another batch of demented, twisted, gruesome, and sometimes even genuinely affecting horror. Though this new storyline is prone to the show's trademark meandering and the characters are disappointingly inconsistent, the series remains worthwhile and the show's themes dealing with outcasts, stardom, loyalty, family, and acceptance are powerful. While this might be Jessica Lange's final season, her swan song offers a fitting conclusion for her time on the series, leading to a powerful curtain call for her memorable performances. With new connections now revealed between previous seasons, 'American Horror Story' continues to evolve beyond its anthology roots, weaving an increasingly connected universe full of ghosts, monsters, witches, freaks, killer clowns, and pesky red carpet stains. 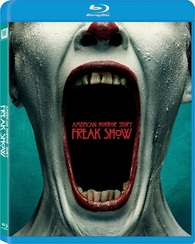 20th Century Fox brings 'American Horror Story: Freak Show' to Blu-ray in a 3-disc set packaged in a keepcase with a cardboard slipcover. All thirteen episodes are spread over three BD-50 discs. After some skippable trailers the discs transition to standard menus. The packaging indicates that the release is Region A coded. The show is provided with a 1080p/AVC MPEG-4 transfer in the 1.78:1 aspect ratio. Despite some minor quirks, the series' creepy visuals continue to impress on Blu-ray. The source is in pristine shape with a light to moderate layer of grain. Likewise, certain flashback sequences offer intentionally stylized looks that offer more grain, higher contrast, and altered colors depending on the scene. Overall clarity is good, fully bringing the extravagant and intricately detailed carnival atmosphere to life. With that said, the cinematography does frequently use a diffuse style that harkens back to classic 50s productions, and this does lead to a soft, glowing quality, particularly during close-ups of the actresses. Colors are surprisingly punchy for a horror series, with many bright outdoor scenes exhibiting solid pop (contrasting nicely against the often ghastly content), and the palette used in the Freak Show sets feature strong splashes of bold hues. And, as always, blood red tends to stand out the most. Contrast varies depending on locations and time periods, but white levels and black levels are mostly balanced well. With that said, dark sequences often exhibit a blueish tint with some noticeable noise. Thankfully, other artifacts are not an issue. Once again marked by a strong visual style, this latest season of 'American Horror Story' looks appropriately "freakish" in HD. The series is presented with an English DTS-HD MA 5.1 track and optional English SDH, French, and Spanish subtitles. Like previous seasons, this is an effectively moody mix that helps to enhance the carnival atmosphere. Dialogue is clear and well prioritized, but there is a very faint crackle in the high frequencies every now and then. Though the sound design can be comparatively front-loaded, the track offers a solid sense of immersion, spreading creepy ambiance around the room. Crickets, approaching footsteps, and creaking doors add a delicately unsettling air to the proceedings, and the Freak Show setting itself features a convincing, albeit comparatively restrained sense of atmosphere. This season also places a rather odd but not unwelcomed emphasis on musical performances, and the deliberately anachronistic renditions of David Bowie and Nirvana all carry full separation, strong fidelity, and wide dynamic range, filling the soundstage with enveloping music. Low frequencies are never particularly aggressive, but appropriate moments feature deep bass cues and there are no technical issues to report. Though not as aggressive as one might expect from a horror series, 'Freak Show' uses its subtly spooky sound design to great effect. Fox has included a solid collection of behind-the-scenes featurettes. All of the extras are presented on disc 3 in 1080p with Dolby Digital 2.0 sound and no subtitles. Getting Freaky: A Peek Under the Tent (HD, 20 min) – This featurette offers a behind-the-scenes look at the making of the season with cast and crew interviews and on-set footage. The participants discuss developing the concept, inspirations, production designs, sets, cinematography, characters, themes, and the decision to start connecting the show's seasons. Two Heads Are Better Than One (HD, 10 min) – This rather fascinating featurette focuses on creating the conjoined twins on screen, detailing the special effects used to film their scenes and the techniques actress Sarah Paulson employed to craft her unique performances. Twisty: Behind the Mask of Terror (HD, 12 min) – Here the focus is on the season's terrifying clown character, offering a peek into the character's development and makeup process. Freaklore: The Spector of Edward Mordrake (HD, 9 min) – The season's Halloween episode two-parter is discussed here, along with details about the supposed real life Edward Mordrake. Extra-Ordinary Artists (HD, 26 min) – This featurette places the spotlight on the show's real cast of differently-abled performers. The unique ensemble discusses their early lives and shares personal stories about growing up different. Filled with enlightening perspectives, this is a great inclusion. Hollywood Freak Show Season Four Premiere (HD, 5 min) – This is a short reel of red carpet interviews with the cast and crew from the series' premiere. 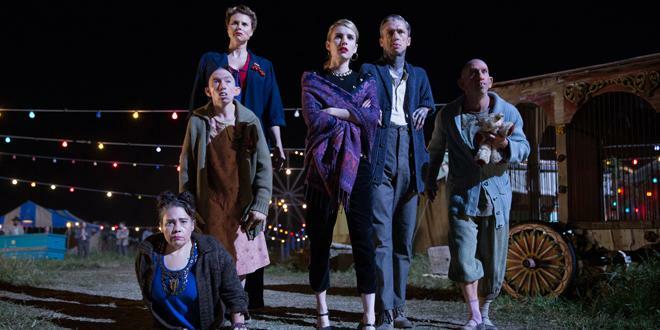 'American Horror Story: Freak Show' offers an appropriately twisted and bloody celebration of outcasts and killer clowns. Though some of the storytelling is inconsistent and the gore can become gratuitous, fans of the show should still find a lot to like here. The video and audio are both good, helping to bring the spooky carnival world to life. Supplements provide an interesting look at the production and offer some enlightening insights from the differently-abled cast. While some might be put off by the gruesome content, this set is perfect for Halloween binge watching. Worth a look.